The state capitol of Pennsylvania is Harrisburg and I have to admit, the Pennsylvania Capitol Building is one of the prettiest that I have ever seen. Okay, I am a little biased since I do live in PA. The Capitol is a public building belonging to the people of the commonwealth. It was dedicated back in October of 1906 and is still showing all of its beautiful architecture. According to records and their web site, it was built and furnished at the cost of $13 million dollars and was designed in the American renaissance style. This is very evident if you have ever visited the building and taken a tour. Just a warning, there are a lot of steps to climb so if you have any walking problems, this tour is not for you. The grounds around the Pennsylvania state capitol building are beautifully kept and well manicured. We love walking around the building and seeing all of the beautiful old trees, green lawn and the flowers. The building looks different from all sides except when you are looking at the dome and is situated on 45 acres of land. If you are planning a trip down to the Pennsylvania State Museum or other downtown attractions, the capitol building is within walking distance of the museum. Parking is hard to come by, especially during the busy weekdays and often times we have to do paid parking, blocks away and walk. 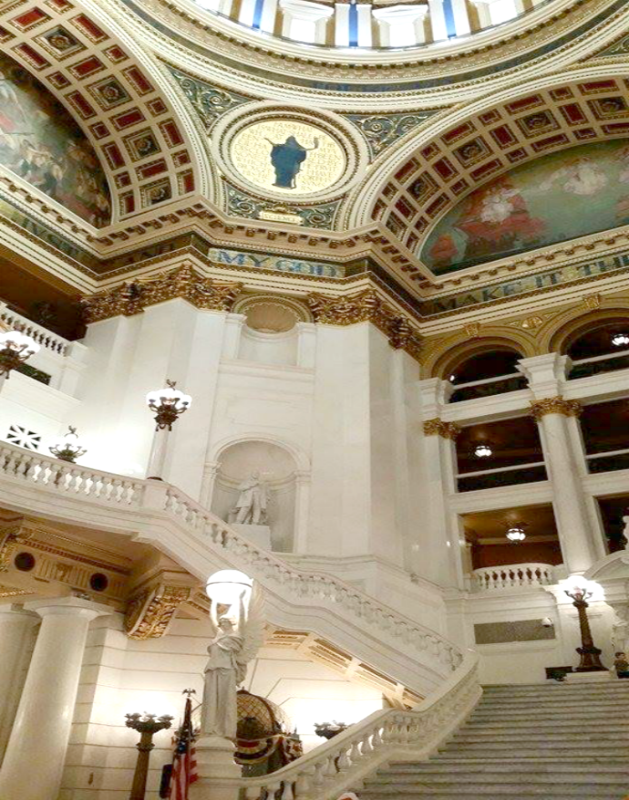 If you visit the PA Capitol Building web site, you can take a virtual tour which is pretty cool for those who can't do a real tour of this historic building. Plus, you can learn all about the history on how this building became to be. Head on over so you can learn more. Enjoy your trip!